I had a busy start to my weekend and then a relaxing end of the weekend. On Friday I threw a baby shower for one of my coworkers and his wife. They are good friends who often watch Pepper when I am on vacation. This is their first child and since both of them work in my department I thought it would be nice for all of us to get together and celebrate their expanding family. I organized the party and made cupcakes and pralines while one of the office assistants supplied some awesome Cars-themed decor. The party was pretty low key just some snacks, present opening and a few games but everyone had a good time. Later, I met up with several of my coworkers and a friend who recently moved away to have dinner at a charming Italian restaurant. This was partly to continue to shower for people who couldn’t make it during the work day and partly just to have a fun evening out. The food was pretty good. We shared several appetizers and then I had a bowl of minestrone and a chicken Caesar salad for dinner. Both were very good and I would definitely consider going back. It started raining during the party and continued to rain most of the weekend. 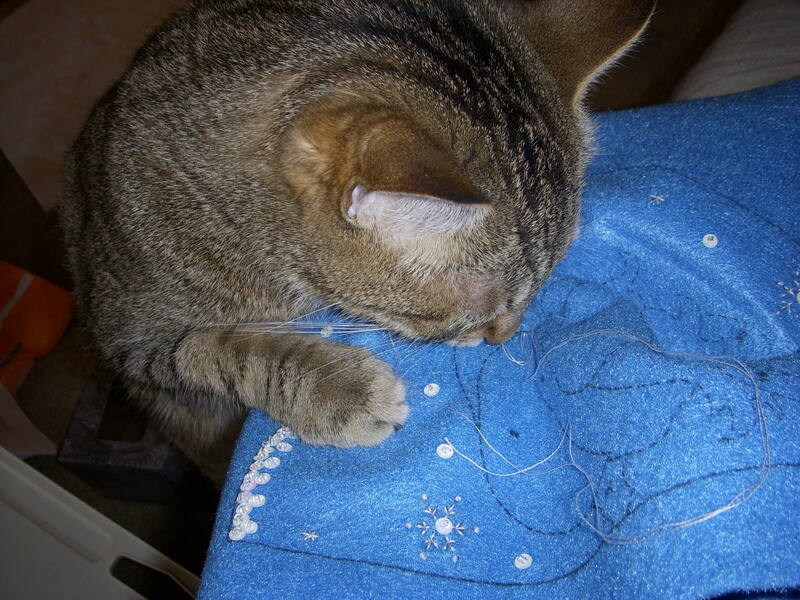 Since it was raining, I didn’t feel like going outside much all weekend and instead decided to curl up with my cat and do some crafts. 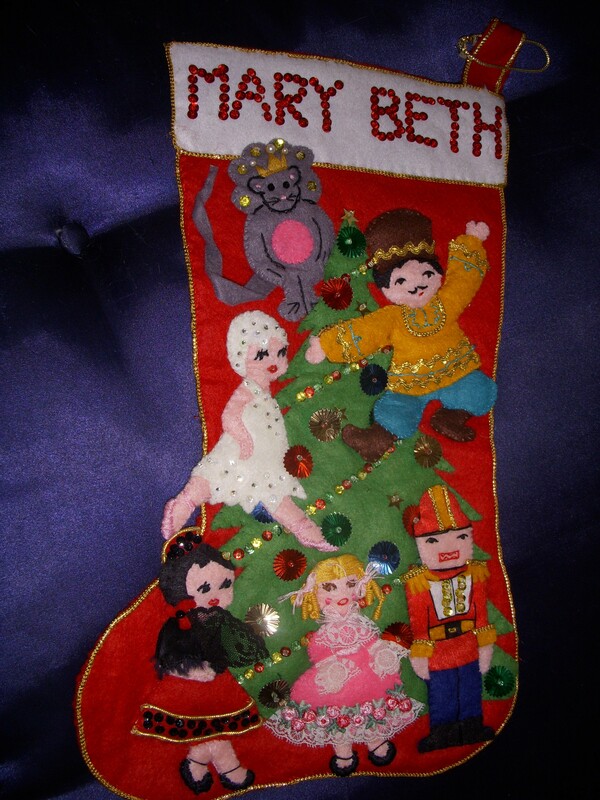 I decided to make Josh a Christmas stocking. I know it sounds pretty random and early to be thinking about or working on Christmas stuff but we are already planning our Christmas trip for this year and I kind of have it on the brain. This year Josh and I plan on visiting his parents for Christmas because last year we went to my parents’ house. They have a really small house so we will have to stay in a hotel room which Josh seems to think will be a little awkward. I have been trying to find ways to make it seem more normal. One thing I think might help is to decorate the hotel room, which will hopefully make it feel more like home. 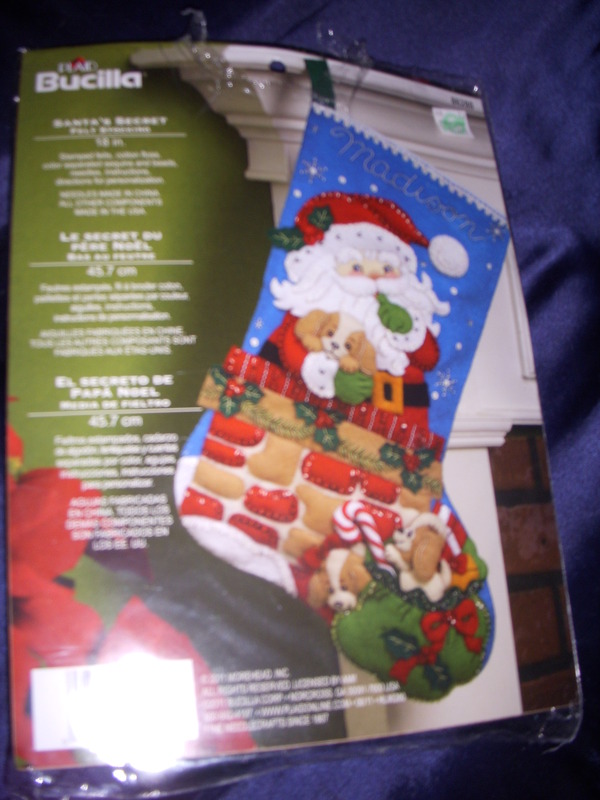 Christmas stockings are small and lightweight and would definitely add some Christmas to a stark hotel room. To this end I decided to make Josh a stocking to match mine. This will be the second year Josh will get a new stocking because last year Mom made him one to match our family stockings. 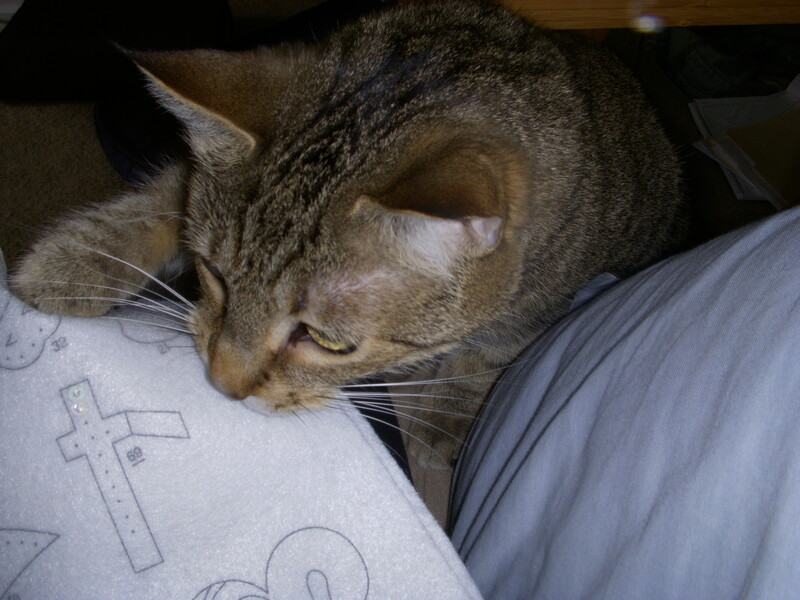 (Yes, I do have two stockings. One for at home and the other for my apartment.) All of the family stockings are quilted and are made of fabric that represents our personalities. Mine has peppermint candies, my brother’s has hot rods and Josh’ has Snoopy and the Peanuts Gang. The stocking was perfect and definitely made Josh feel like part of the family. 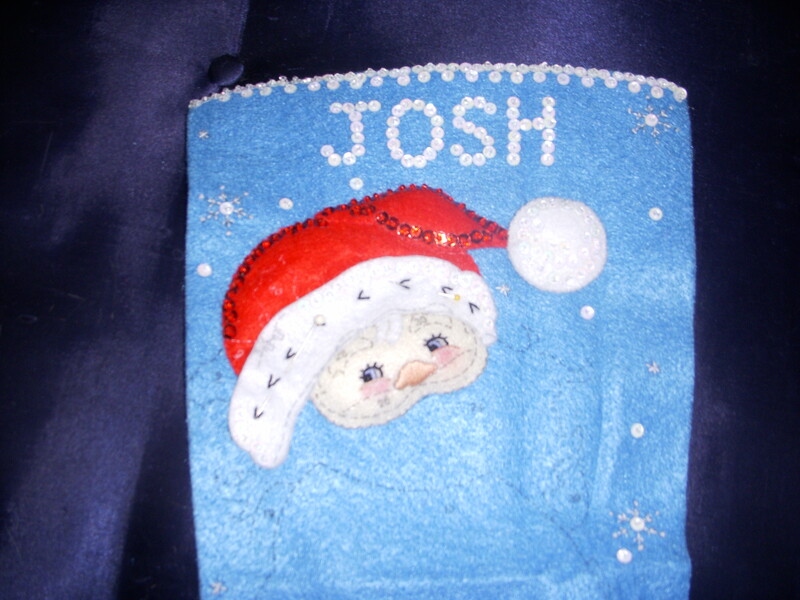 Anyway, I decided Josh should have a felt stocking to match mine. I looked at all of the possibilities at the craft store and this is the one I chose. It has Santa with a bunch of Puppies. Josh loves dogs so I thought this would be a good choice for him. I realized after I’d already started making it that this stocking points in the opposite direction of my stocking! I hope it will look good anyway. 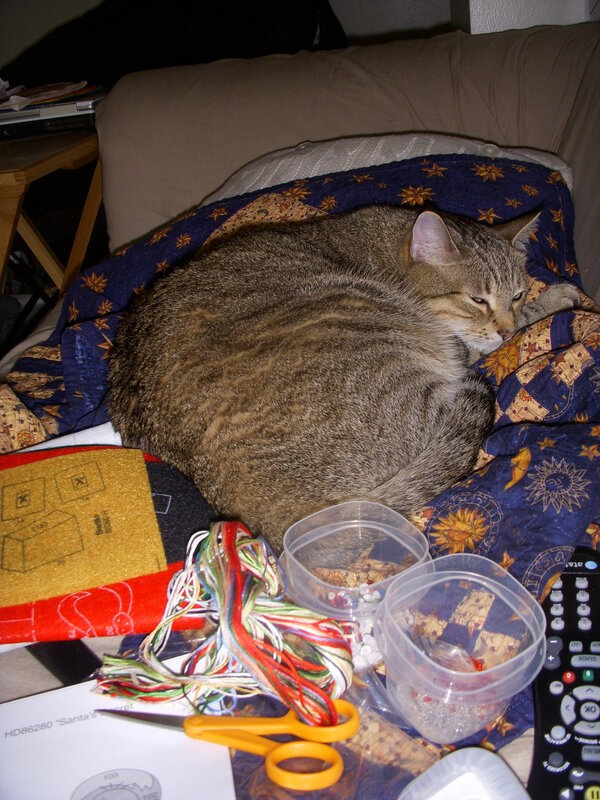 I spent most of the remaining weekend sewing on the couch and watching a marathon of Once Upon a Time. I can’t wait for that show to start in a few weeks. 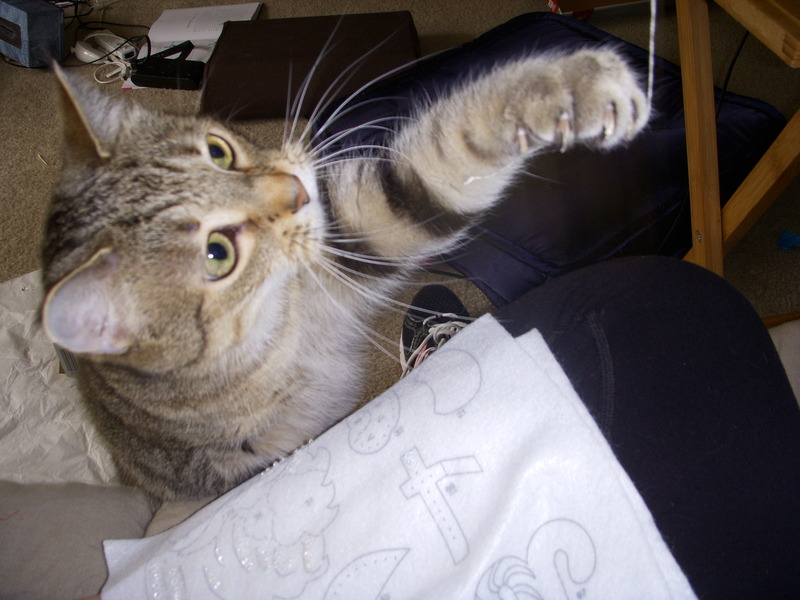 Oh, and Pepper tried to help me by batting at my hand and trying to eat the thread. 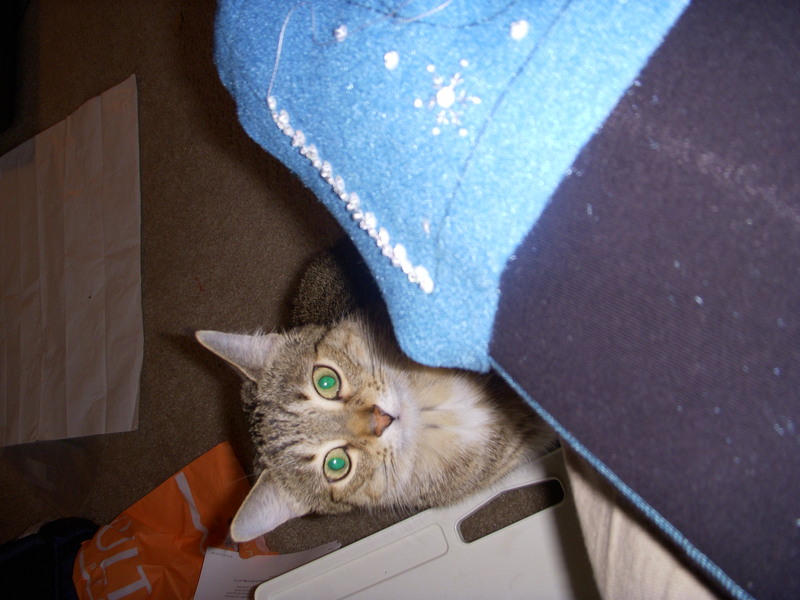 She sure likes to help me sew! Oh and in case you are wondering, here is what I have finished so far. Your cupcake decorations look like Crave Cupcakes from Houston! So cute. Thanks. 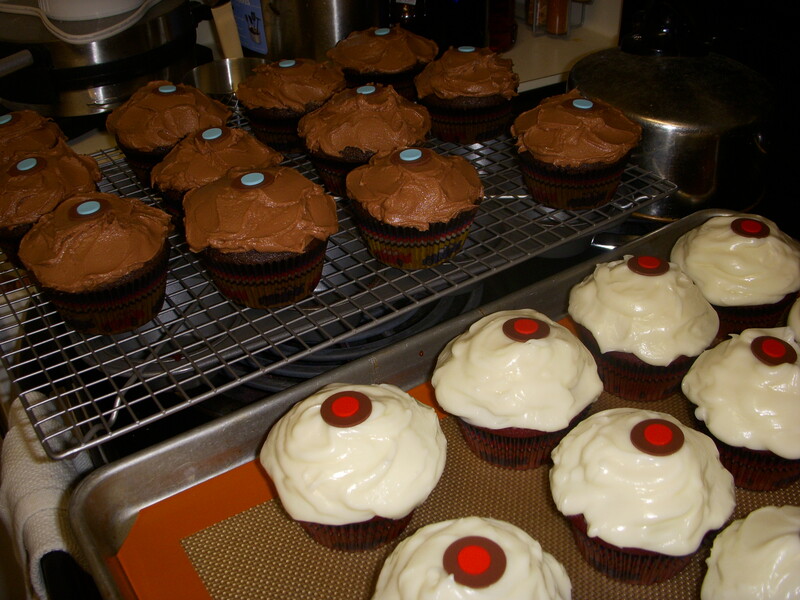 They are the Sprinkles cupcakes from Williams Sonoma.